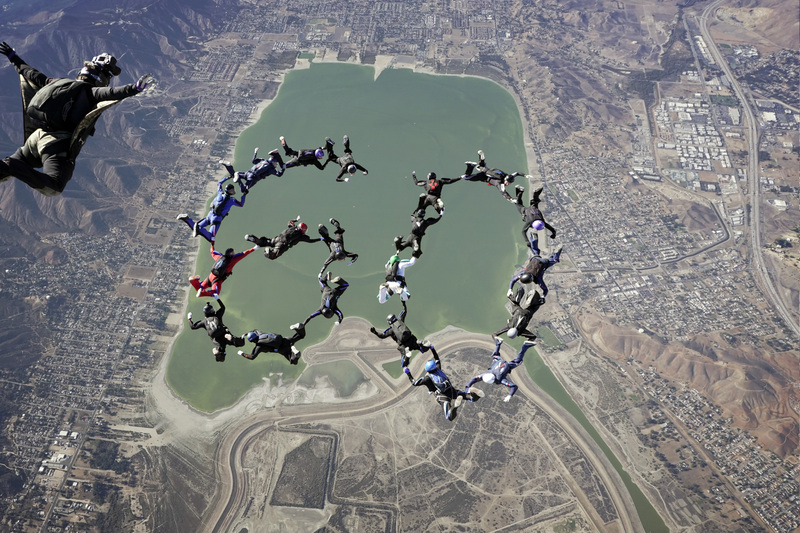 Happy 60th Birthday Skydive Elsinore! On March 1, 1958, Cy Perkins took a skydiver (whose name is lost to time) up in his Cessna 172 and let him fall out over Skylark Airfield. To kick off the celebration, Josh Hall lead a group of very experienced skydivers in the sky to form the 6 0 formation. Months ago, Daniella Martin, Operations Director at Skydive Elsinore, sent out a call to skydivers that have been jumping at Skydive Elsinore that might have some items to put on display. They didn’t disappoint, and Daniella set up a mini museum of sorts for all to enjoy. Larry Perkins, the son of Cy Perkins, share many family memories with pictures and scrap books. During the day, seven ten-way teams participated in a good ole fashion ten-way speed star competition. A handicap was included in the no show, single file exit, so that low jump number skydives could join in on the fun. Zack Winoker led team Cluster Thunder From Down Under to victory. The ten-way competition was such a success that Skydive Elsinore will be hosting it again next year. Dinner was served, and people enjoyed watching some of the classic moves, that had been filmed by Carl Boenish over Skylark Airfield. The movies “Skydive” and “Masters of the Sky” have stood the test of time.